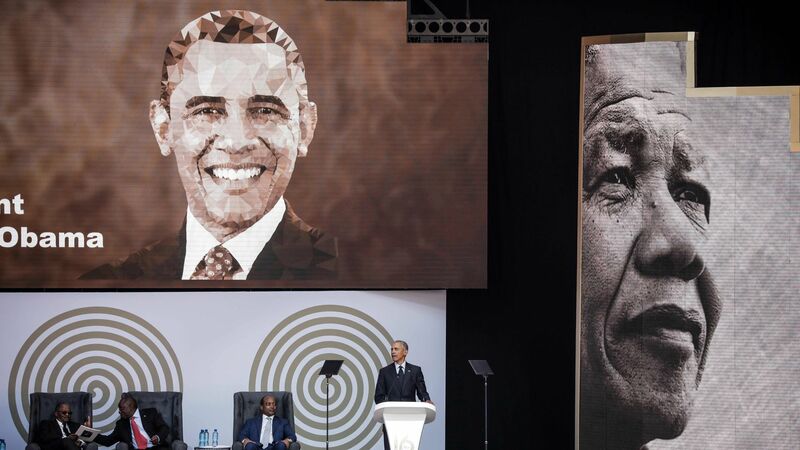 Addressing a huge crowd in South Africa on the 100th anniversary of Nelson Mandela's birth, former President Barack Obama offered some guidance for what he described as the "strange and uncertain times" in which we live. "On Madiba’s 100th birthday, we now stand at a crossroads. A moment in time in which two very different visions of humanity’s future compete for the hearts and the minds of citizens around the world." A word of advice: Amending a quote by Mandela, Obama said we have an obligation not just to protest in the name of universal freedom, but "to build," "to innovate," and to "figure out how we're going to close this widening chasm of inequality." On authoritarianism: "Strongman politics are ascendant suddenly. Whereby elections and some pretense of democracy are maintained — the form of it — but those in power seek to undermine every institution or norm that gives democracy meaning. In the West, you've got far-right parties that oftentimes are based not just on platforms of protectionism and closed borders, but on barely hidden racial nationalism." On inequality: "We’re going to have to fight harder to reduce inequality among all people. I don’t believe in economic determinism. Human beings don’t live on bread alone. But they need bread." On the future: "I believe in Nelson Mandela's vision. I believe in a vision shared by Gandhi and King ... I believe in a vision of equality and justice and freedom and multi-racial democracy built on the premise that all people are created equal." On globalization: "We’re stuck with the fact that populations live closer together and people are going to move. The solutions to challenges like climate change and mass immigration are systems that move toward more international cooperation. Not less." On the media: "The free press is under attack. Censorship and state control of media is on the rise. Social media, once seen as a mechanism to promote knowledge and understanding... has proved just as effective promoting hatred and paranoia and propaganda and conspiracy theories."